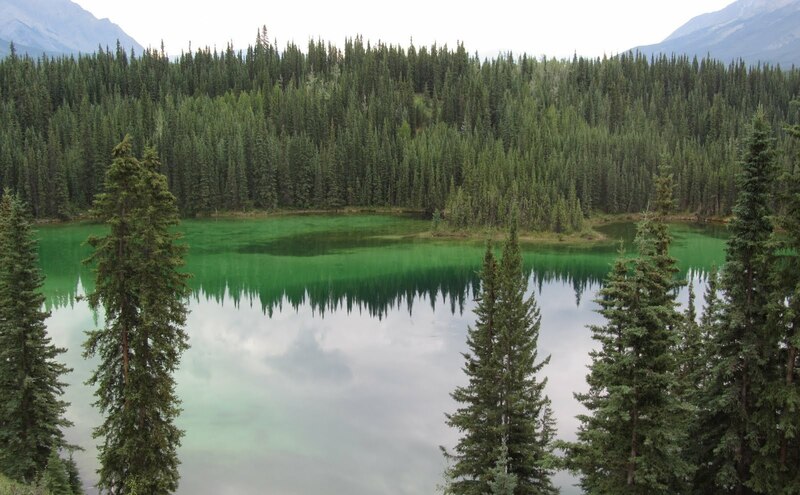 Rabbitkettle Lake and its surroundings are beautiful and contains some unique landscape features. Almost as beautiful was the fact that a box awaited me with food for another eight days, nice since I was running very low on supplies. At Rabbitkettle Lake warden station I found a minor town. Perhaps I was over-reacting after almost two weeks in the bush. 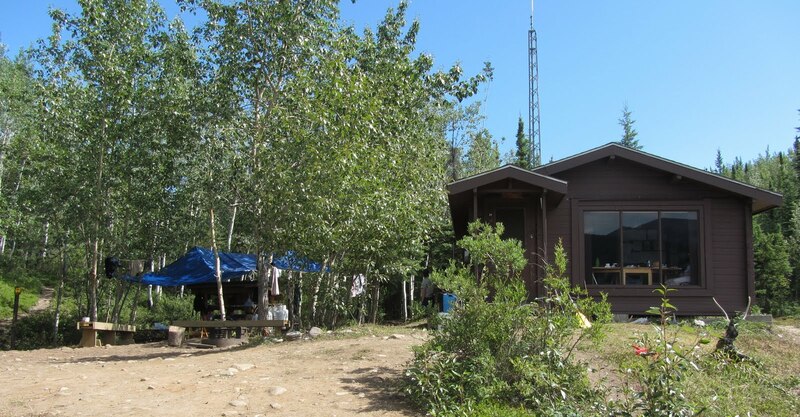 All around the warden cabin there were a number of tents, a tarp that covered the kitchen table and lots of teenaged First Nation kids swimming in the lake and generally having a good time. This was a special camp for them on account of Parks Canada celebrating its 100th Anniversary. After the first stop-in-midstep-reaction it felt really nice. 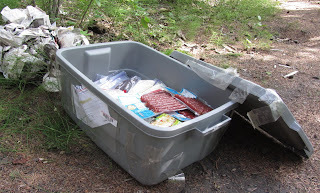 One of the Parks Canada interpretors registered me, instructed me on how to behave and not behave in the park and gave me access to my box of goodies. In order not to be at Rabbitkettle before my box arrived, giving some leeway for screw-ups etcetera, I had put my date of arrival there as early as I honestly could. This in combination with me being a couple of days behind even a more realistic schedule had made them a bit worried about my whereabouts. They had in fact contacted my old army buddy Per in Calgary around the time I arrived at Rabbitkettle; something I found out later. The food box contained all I needed and after a brief but very nice swim in the lake, getting rid of the top-soil that had accumulated on my skin, I went back to the river, where the camp-site was. I unpacked my food and took the opportunity to rinse and was my dirty clothing in the river. 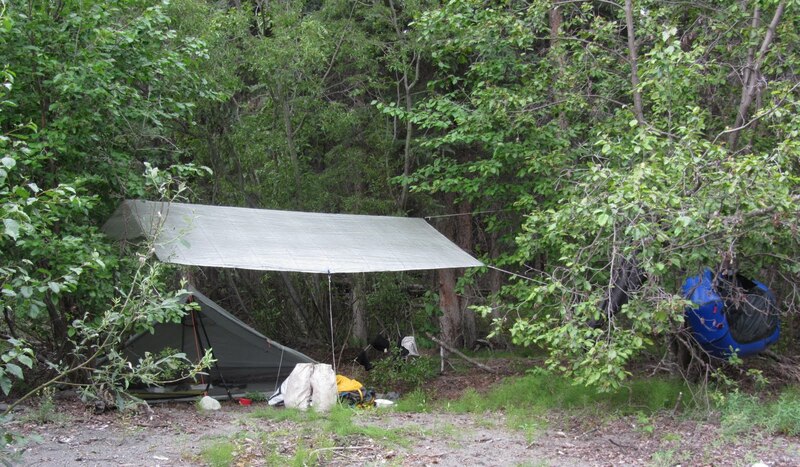 This camp I also shared with my Limey friends, which further dented their supplies of distilled nutrients. 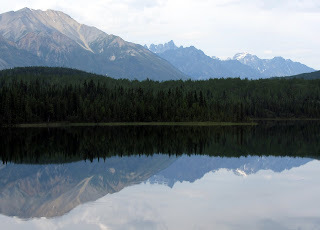 In the morning me and the Brits all returned to Rabbitkettle Lake, to take part of a guided tour by Parks Canada. They had experienced some bear action during the night and had been out firing some bangers at an inquisitive black bear snooping around. None off this had penetrated to us at the regular campground by the river. The tour was led by a couple of young Denes, Jordan and Logan, supported by the more seasoned Dene Jerry, from Parks Canada. One of the features around Rabbitkettle is this beautiful little lake. 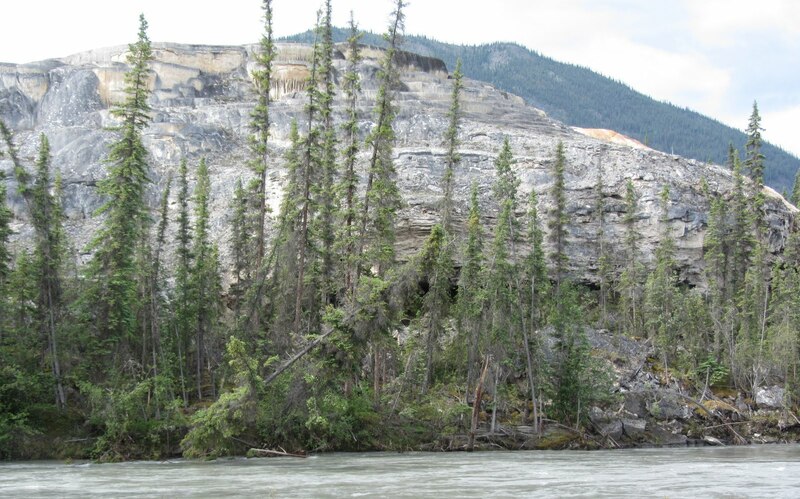 It is a pseudokarst feature known as a piping sinkhole. Now exactly what this is is not that easy to understand for us mere mortals, but it certainly has a marvelous color. The really unique features at Rabbitkettle are the tufa mounds, which is the giant pastries admired by Dan Spry and Mark Gittoes above. A disappointment for me was that the mounds were no longer open to visitors, something I found out a month before leaving home. 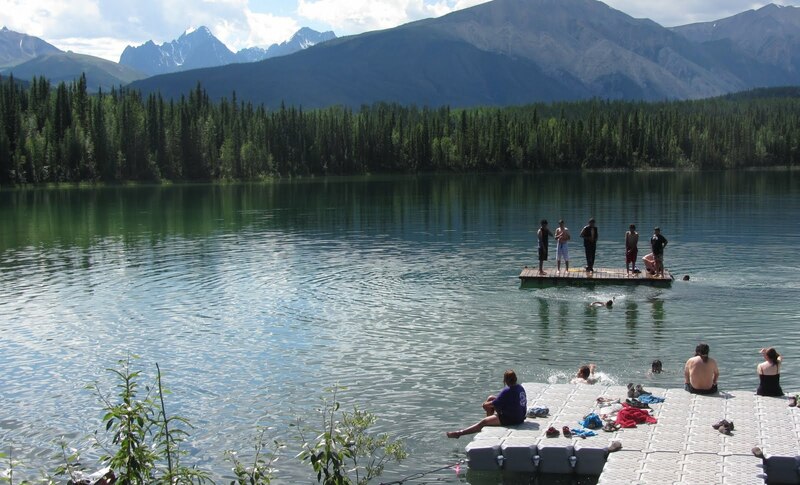 Up to this summer they have only been accessible to the public in company with someone from Parks Canada. You have not been allowed to walk on them except barefoot. Now this was no longer allowed. Tufa mounds are in fact hotsprings containing dissolved calcium. Most hotsprings smell of rotten eggs, since the water contains quite a bit of sulphur. The sulphur keeps the calcium in solution, but in this case the sulpur content is low. This enables this particular hotspring to form this magnificent open-air stalagmite by thousands of years of sedimented calcium. 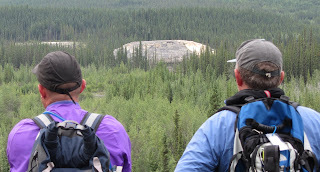 Here we can judge the height of the biggest of the two tufa mounds, about 30 meters, from across Rabbitkettle river. There used to be a boat hooked onto a cable that ferried people across, but the permafrost had done its usual job and Parks Canada had declared the anchors for the cable on boths sides of the river unsafe. This was why we could not walk upon the mound and look down into the hotspring on top. So this is as close as we got to this amazing feature. 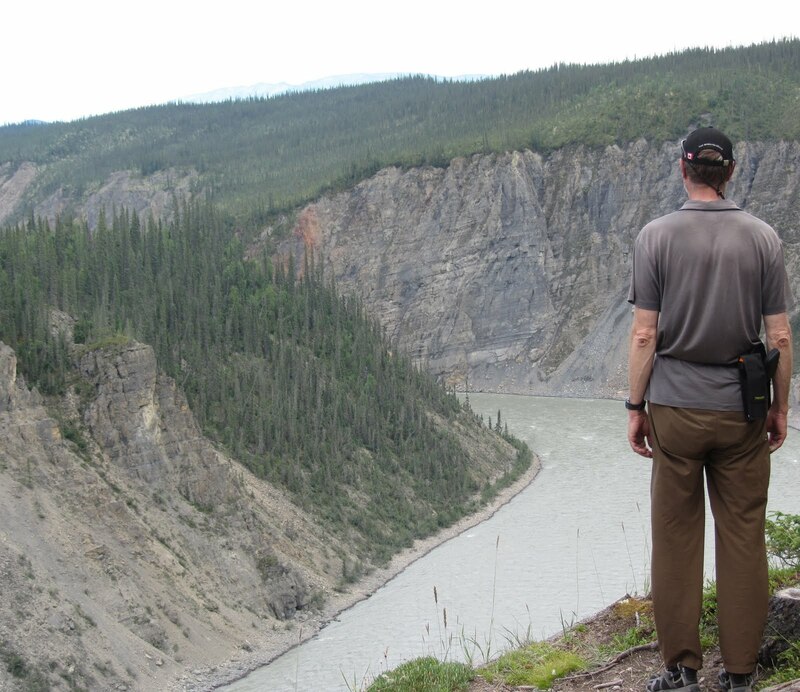 After the walk to the mounds and another swim in Rabittkettle Lake where the camp had been visited by a black bear during our tour, I returned to the Nahanni. While inflating my packraft and getting everything ready to go, I met a young guide, David Lichty, from Nahanni Wilderness Adventures. 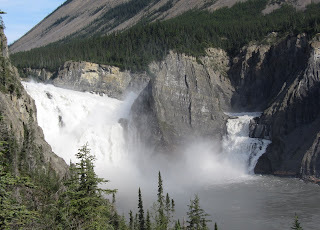 He was taking three clients down to Virgina Falls in canoes and got really interested when he heard about my hike into the Moose Ponds and packrafting down the Nahanni. Pretty soon after Rabbitkettle the river changed its appeareance. It now flowed in leisurely meanders down a wide glacial valley. Gone was the 10 km/h current, and it became necessary to earn ones way. I knew that I had at least two days of steady paddling ahead of me. To begin with if felt a bit dull compared to what I had experienced before. But when I realized that this really also was what I had come for I enjoyed this stretch of river as well. I was soon back to my ordinary routines. Note above that the packraft is tied to a tree during the night. Some small rodent chewed away at my wooden spoon one night. This led me to conclude that it would be too bad if some small animal like that decided to give the raft the same treatment. From then on the raft slept in the trees. Paddling down the slow-moving river it was definitely brought home to me that in slack water like this the packraft could not keep up with canoes. It does not track very well, and of course you are only one person paddling. This led to me running into Dave and his party several times in the next couple of days. They took longer breaks, but paddled faster than I did. Since Dave knew the river very well I took the opportunity of interviewing him about the whitewater stretches waiting down stream. A long stretch of wide river, almost a lake, and a headwind made the last couple of kilometers to Virgina Falls a bit of a struggle. 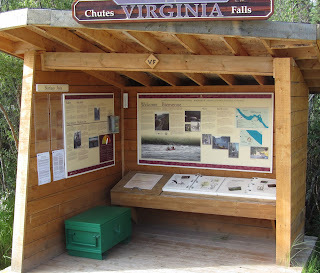 Another checkpoint and even more of a town met me at famed Virginia Falls. 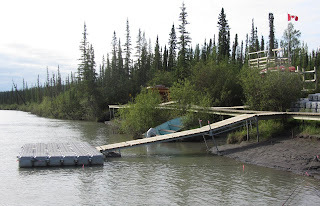 To spare the vegetation around the Virgina Falls campground there are a number of boardwalks as well as platforms for the tents. 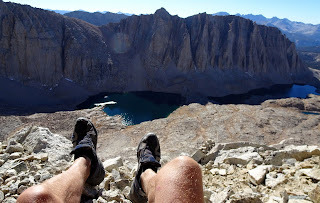 Camping on planks was a new experience, and I had brought no nails. David tipped me off about using dry sticks from the ground of suitable dimensions. 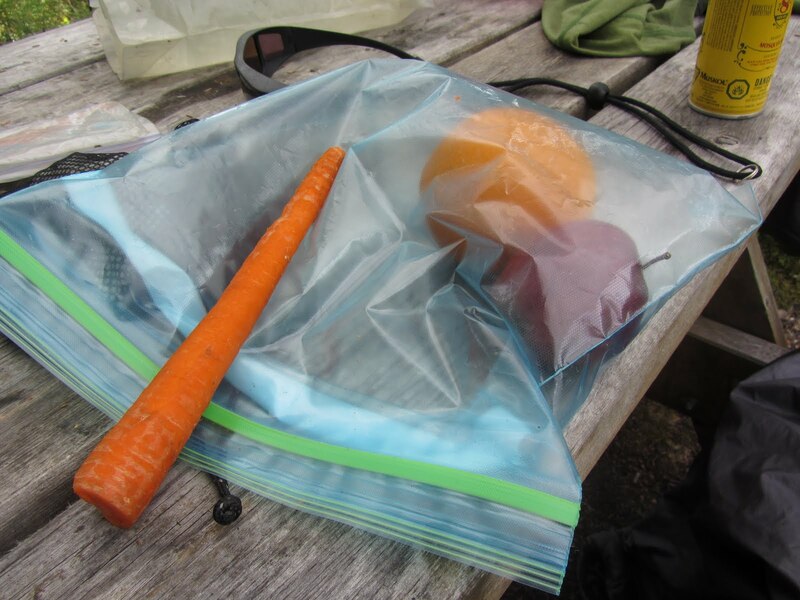 These you could wedge in an pound down between the planks and use in a simile of ordinary tent pegs. 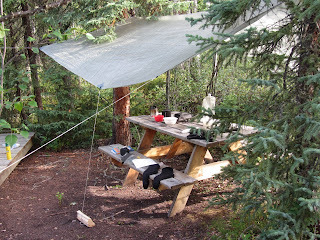 With the tarp pitched over the nearby table I lacked no modern conveniences. 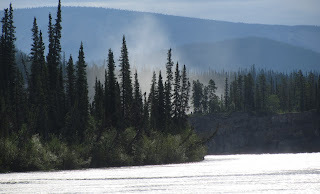 In th photo above you can see the river from the campground, taking a corner. 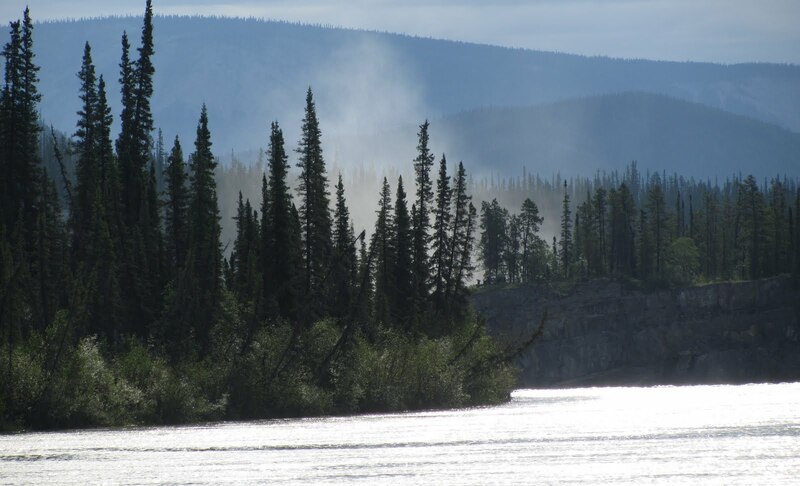 The mist is water droplets floating above the falls. 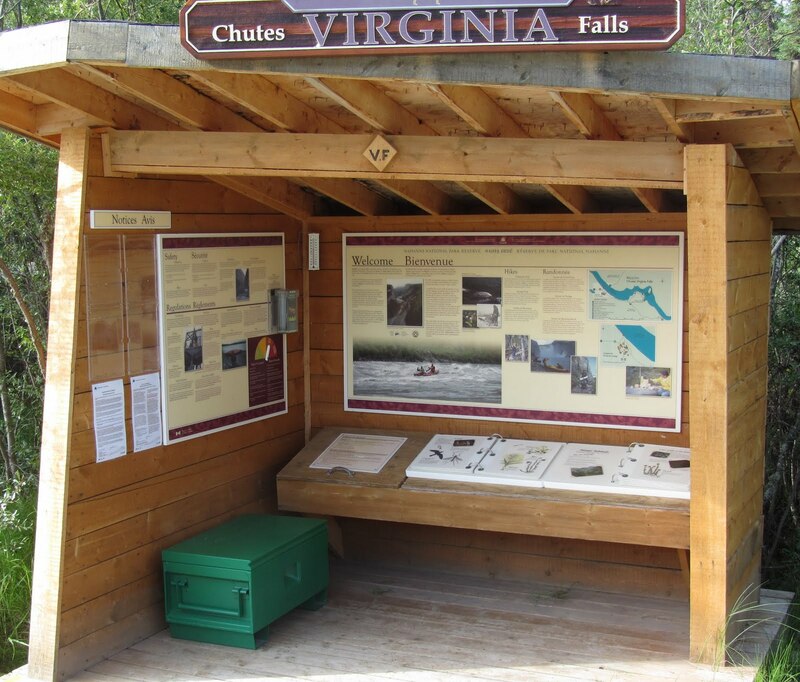 Virginia Falls is a spectacular feature in the middle of a wilderness. Most people canoeing or rafting down the Nahanni fly in to the falls and paddle downstream. 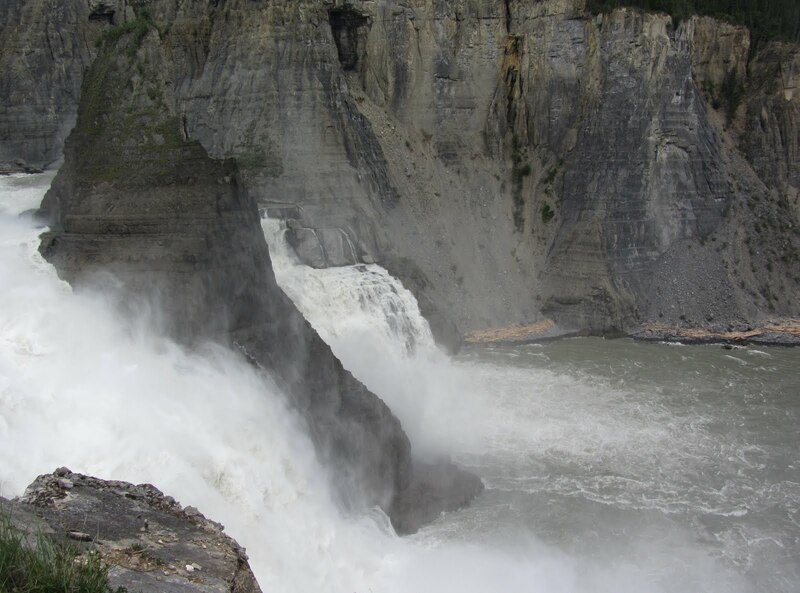 It is often pointed out that Virginia Falls is twice the height of the Niagara Falls. 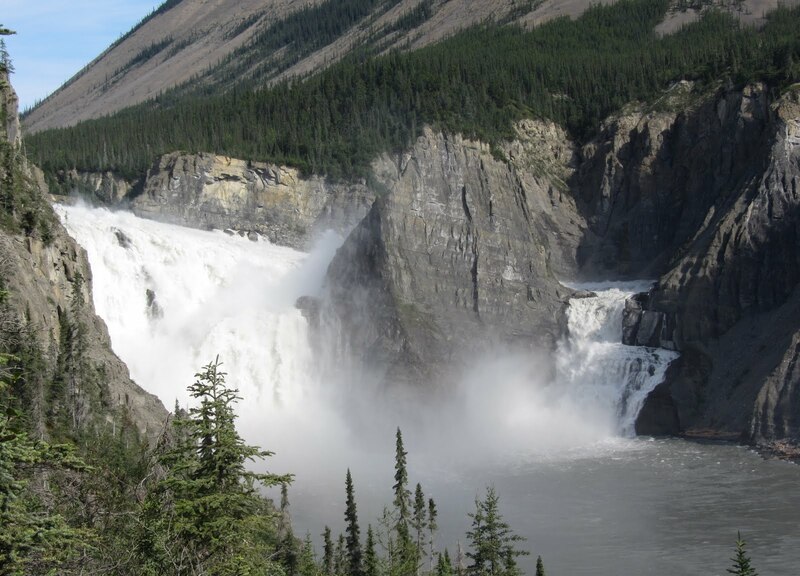 The rock in the middle of the falls is unofficially called Mason's Rock, after Canadian canoe guru Bill Mason, author of The Path of the Paddle. 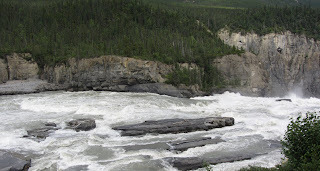 If you want to learn whitewater canoeing I can recommend some beautiful films of his on the http://www.nfb.ca/ site. Whitewater solo is a good example. Above the falls the Sluice Box rapids are no place for any form of canoeing. The ancient portage trail around the falls only starts 30 meters before these rapids. It is not as scary as it might seem, the water flows nice and slow. Archeological findings show that this has been used as a landing spot and portage trail around the rapids for thousands of years. Another wonderful report Jörgen, the vision of you being told to behave made me smile. 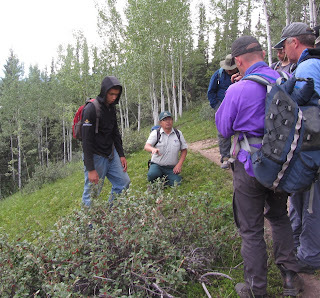 Chance meetings with locals in the wilderness are always helpful when travelling. Were the Denes, Danes? If so, its amazing to travel so far to be guided by scandinavian locals. 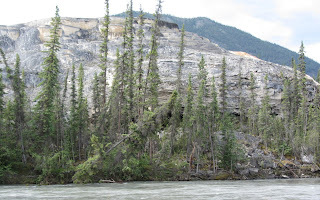 Dene is a First Nation tribe of aboriginees living in the Nahanni area. They were formerly known as 'indians'. Thanks for the clarification on Denes, never heard that term before you learn something new every day. Great adventure! 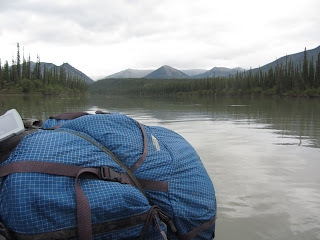 Packrafting looks like a great way to see the wilderness. That looks like a One on the platform. Nice pitch for sure. How is it working for you? Yep, it's a GG The One. 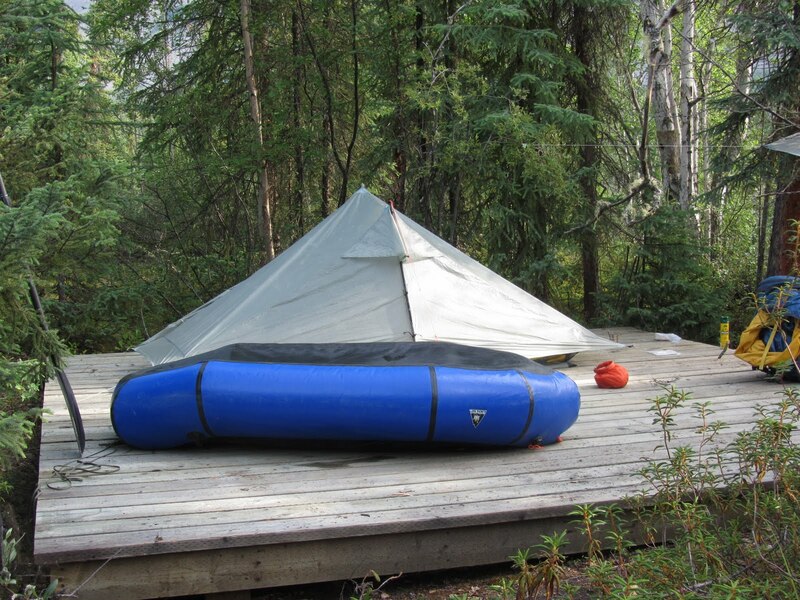 Ideal for this trip and my favourite shelter in forest and 'semi-protected' areas. 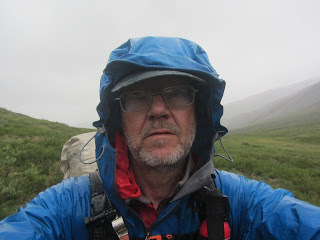 I have used it quite a bit on open tundra as well, but would not quite trust in really hard wind/storm. As long as there is no wind from the wrong direction it is not that tiring.